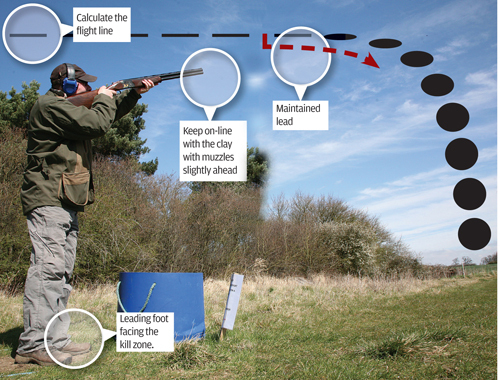 Clay shooting: How to hit battues. This is usually one of the busiest times of the year for me. As well as running the shooting ground and coaching clients, I’m also helping to finish the harvest at home on the farm. It’s generally a hectic, all hands to the pumps few weeks, and it’s rare I get the chance to sit down, check through all the recent correspondence and find some time to get stuck in to write my article. Usually… Unfortunately, a week or so ago while loading one of the clay traps I had a bit of a mishap. I slipped, and caught my foot in an exposed tree root as I fell. My body, however, decided it would be best if it carried on turning and moving – breaking my leg in three places. Ouch. Desperately trying to put on a brave face I’m convincing myself that every cloud has a silver lining. So, as I’m now confined to barracks for a month or two, I can finally get stuck in and clear my overflowing in-tray! At the top of the pile is an interesting email from a reader called Roy who shoots English Sporting most weekends at his local shooting ground, Southdown, near Worthing, East Sussex. Although he tells me he regularly shoots 75/80 ex 100, he struggles to hit even the odd single battue on an entire layout and this is ruining his averages. Unfortunately Roy’s problem is typical of many shooters. So why are battues so tricky for so many people? 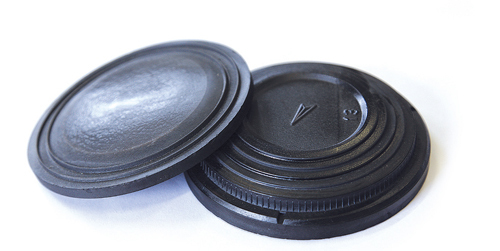 ‘Battue’ clays are roughly the same diameter as standard birds, but they’re thinner and concave in design. Because of their physical size and shape they come off the trap arm very fast. The target will maintain a reasonably consistent speed and direction through the air… until the moment it starts to run out of power. At this point the bird will usually flip over onto its side, gravity starts to take effect and it then speeds towards the ground. 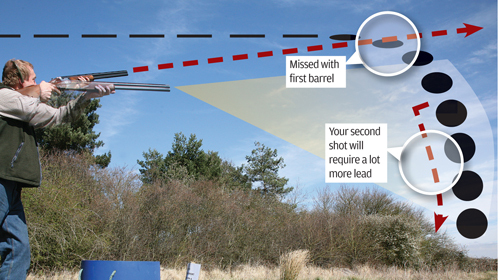 For this exercise we’ll assume that the shooter’s stance, ready position and gun mounting technique are all up to scratch and, after having seen the target presented, the pick up and approximate kill points are clear in the shooter’s mind. • Remember the birds are fast, so the first thing to remember is to adjust your stance accordingly. This means it might be best to have your muzzles slightly ahead of where you would for a standard target. This isn’t crucial, but if you don’t you might end up playing catch up with the clay. The position of your feet might also have to be altered slightly – but you should still keep your leading foot pointing somewhere towards the chosen kill point, though – so that you don’t run out of swing. • Taking speed into consideration, I’d recommend using maintained lead for shooting this type of bird. Because your muzzles will naturally stay ahead of the target you haven’t got to worry about getting in front. These extra few moments can make all the difference so make sure you use them. • Concentrate on the flight line of the target and try to anticipate the ‘roll over’ so that you’re ready to pull the trigger as soon as it occurs. Generally most course designers will present a battue as some form of crosser. 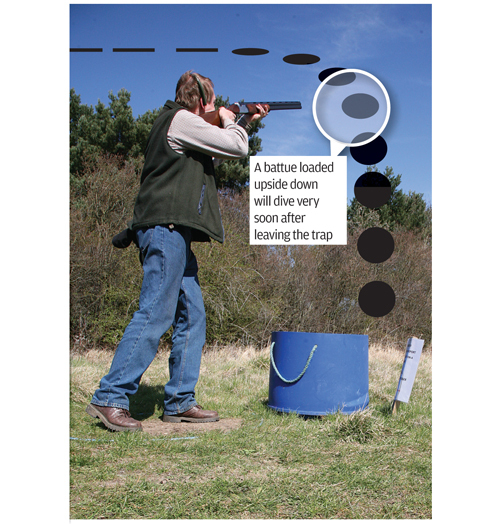 From the outset this can create problems for the shooter as the wafer thin profile of the bird makes it hard to pick up visually and, obviously, it’s a slim target to hit. There are two main reasons most shooters choose the area where the bird is turning in the air as their kill point. First, because this will be the first time the clay is seen as a ‘full on’ target, and, secondly, because its flight line is still pretty predictable. Hesitate and pause for a moment, however, and the clay will seem to develop a mind of its own and it will plummet on what can sometimes seem to be an erratic course towards the ground. As a result, as soon as you see the bird flip onto its edge, it’s crucial you don’t ‘wait and see’ what else the clay is going to do. Believe me, it’s going to be considerably harder to hit on the way down. Every second counts when it comes to hitting battues. If for some reason you miss the bird in your preferred kill zone, you’ll find you’ve no option other than to shoot the bird as it plummets downwards. In this situation the only advice I can offer is to give it loads more lead than you’d naturally think – I reckon double would be a good rule of thumb. Also remember you’ll need to allow a bit for the arc of the clay as it will almost certainly be either curving away from, or towards you. Some sneaky course designers (me included) who will sometimes present a variation of the classic battue. By loading the clay upside down in the trap the clay will roll over and dive very soon after leaving the trap, a real looper of a target. Here you’ve really got to be on the ball to get your shot in before the clay plummets into the ground. 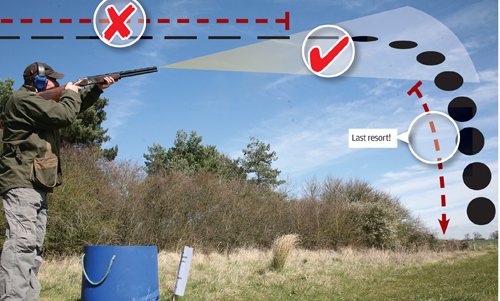 Shoot ‘gun up’, if the rules allow, trust your instincts and rely on basic snap shooting techniques.